1.Quickly scale your recipes (add, subtract, multiply, divide) using fractions! ***** Exactly what I've been looking for! - "I just tested this out on a new cake recipe and it was simple, easy and accurate. The cake came out *perfect*!" by njanehair. ***** Yippee, perfection! 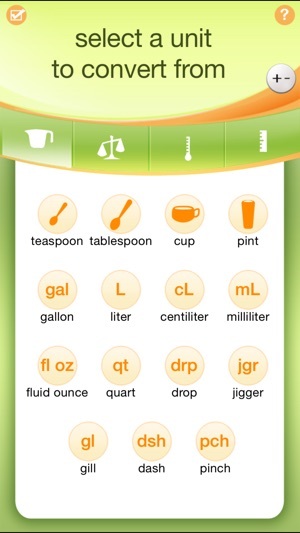 - "I cook 3 meals a day for my toddler and am always needing to scale recipes down so I'm not making ridiculous amounts of food" by Cindi M.
***** Brilliant - "For a cook trained in the metric system, this tool is a dream come true" by BeeDiana. 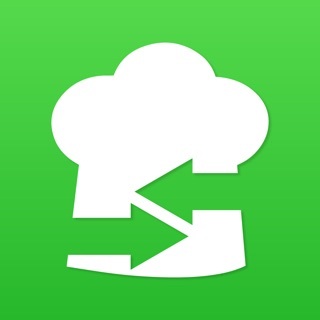 Easily convert and scale recipes in an instant. Doubling a recipe (or cutting a recipe in half) is simpler than ever before, with all the most common units of cooking measurement right at your fingertips. What is so special about weight to volume conversions? When converting from weight to volume it is important to take into account the ingredient you are converting. As you know, a cup of sugar does not weigh the same as a cup of rice. Furthermore, a particular brand of sugar may weigh different from another. 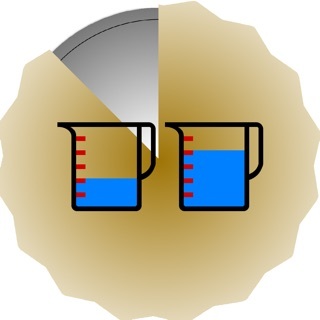 This is all made easy with Kitchen Calculator PRO. So, how does Kitchen Calculator handle weight to volume conversions? 1.It comes with a database of common ingredients based on weight figures from the USDA (US Department of Agriculture). 2.It allows you to quickly enter and save your own ingredient weight for more precise conversions. In many cases, you can enter the values right off the product label, using fractions! 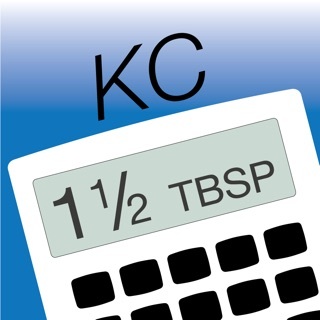 3.Kitchen Calculator will remember any saved ingredient information for future conversions. NOTE: The preset ingredient list is based on USDA (US Department of Agriculture) figures and are approximate values. They may differ from the ingredients you use. 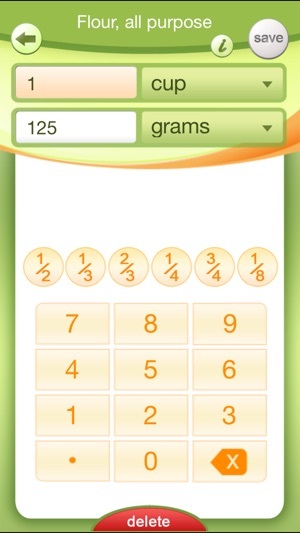 For precise calculations we recommend entering the weights for your ingredients and, whenever possible using a scale. U.S. Department of Agriculture, Agricultural Research Service. 2007. USDA National Nutrient Database for Standard Reference, Release 21. Nutrient Data Laboratory Home Page, http://www.ars.usda.gov/nutrientdata Note: Release numbers change as new versions are released. PLEASE LET US KNOW OF ANY ENHANCEMENTS YOU WOULD LIKE TO SEE. Power and Efficiency in the Kitchen! Have you ever found yourself in this situation: you have a great recipe, but it calls for the wrong number of people and you're going crazy trying to figure out the right amounts of ingredients to fit a particular number of servings. Or the recipe calls for units you're not particularly familiar with and you would like to use those units of measurements that work for you? 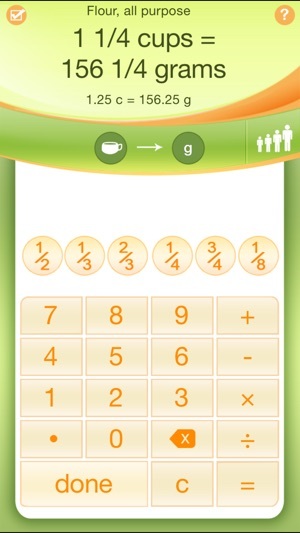 Well now you can, with Kitchen Calculator Pro! It quickly scales recipes to the amounts you want, also using standard cooking fractions, and converts all kinds of units, including weight to volume! Did I mention that there's already a list of ingredients to select from and convert to the desired unit, and if the ingredient is not there you can add it? I've had experience with various converting apps, but this is by FAR the most POWERFUL and EFFICIENT app I've come across! The developer's name is Forward Leap. The name fits the app!!! I've tried emailing the developer but it bounces back. So maybe they'll see my request, here. I often convert several ingredients using the same measurement. E.g. cups to grams. It's easy enough to switch between units but the only way to change the ingredient is to start completely over. This is tedious and time consuming. I'd love for the next version to allow for quickly changing the ingredient without having to also reselect the units. I purchase the app after reading the reviews and I do not recommend it. It does the math but the design is so poor that it makes it impossible to enjoy it and do what you really need it to do. 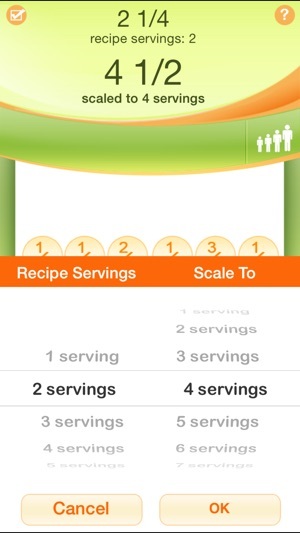 I wanted to add a recipe and then ask the app to increase the number of servings. 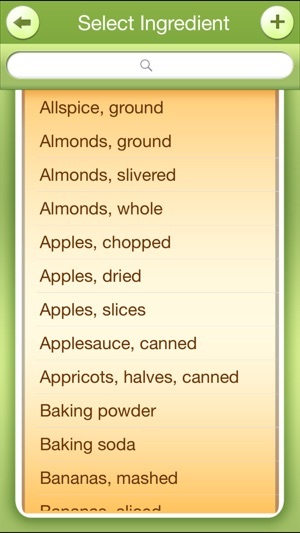 The app does not do that, it takes the ingredient and converts it, but only one at a time. I feel I paid money for a calculator that is not only in my mind, but also free in the internet. I was hopping the app would take the entire recipe with the number of servings and then Increase the amount of each ingredient according to the number of servings required. I make about 200 muffins at once and struggle each time to get just the right amount of ingredients to avoid left overs. © 2014 Forward Leap, LLC All rights reserved.